Human Rights and Moral Reasoning. A comparative investigation by way of three theorists and their respective traditions of enquiry: John Finnis, Ronald Dworkin and Jürgen Habermas. Rome: Gregorian & Biblical Press, 2009. “Conversations on Catholic Third-Level Education.” The Furrow 63 (2012): 67-76. Book Review: Ethna Regan, Theology and the Boundary of Ethics. Irish Theological Quarterly 76 (2011): 99-101. Book Review: Stephen J. Grabill, Rediscovering the Natural Law in the Reformed Theological Ethics. Irish Theological Quarterly 73 (2008): 210. “The Political, the Logic of Gift and Caritas in Veritate.” Paper delivered as the St. Cuthbert’s Visiting Research Fellow, the Centre for Catholic Studies, Durham, UK on May 23, 2012. Caritas in Veritate from a theological perspective.” Paper presented at a conference on Caritas in Veritate associated with the Annual Michael Devlin Lecture, St. Patrick’s College, Maynooth on February 16, 2010. “Theology After Artane.” Paper presented at Interface Conference: Being a Young Theologian in the World Today, St. Patrick’s College, Maynooth on November 7, 2009. 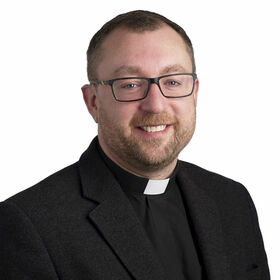 Priest of the Archdiocese of Dublin, ordained in 1998. Undergraduate studies in UCD (BA Political Science and Philosophy) and Clonliffe College (BD Theology); graduate studies at UCD (MA Philosophy) and the Pontifical Gregorian University in Rome (STD Moral Theology); further studies at Marino Institute of Education (Post Graduate Diploma in Catholic Education and Leadership) and Maynooth University (Post-Graduate Diploma in Higher Education); Curate at Our Lady of the Assumption Parish, Ballyfermot (1998-2000); Curate at the Parish of Saggart, Rathcoole and Brittas (2006–2012); Parish Chaplain at the Parish of Saggart, Rathcoole and Brittas (2012-present); St. Cuthbert’s Visiting Research Fellow, Durham University (2012); currently, secretary to the Bioethics Consultative Body of the Irish Catholic Bishops Conference, Chair of Irish Theological Association and member of the Association of Teachers of Moral Theology.